Kia has launched a new compact SUV aimed at pinching sales from the likes of the Nissan Juke and Peugeot 2008. Named the Stonic, the car is based on the Rio, and comes powered by the same highly efficient petrol and diesel engine as Kia’s popular supermini. That means buyers will be able to choose from a single-litre T-GDi with 118bhp, as well as a 98bhp 1.4-litre naturally aspirated MPI. Meanwhile, diesel drivers can opt for a 1.6-litre CRDi turbodiesel with 108bhp, which is also available in Kia’s Golf-sized Cee’d. This diesel is likely to be the fleet favourite, promising a combined fuel consumption of 67.3mpg and 109g/km CO2 emissions. The other two petrols report 56.5mpg and 51.5mpg at 115g and 125g/km CO2 respectively. Hair-raising performance isn’t a speciality for any of the engines, but the quickest in the range is the single-litre petrol with a 9.9-second 0-60mph sprint. The Stonic was originally developed for European drivers exclusively and suspension and steering have been tuned to reflect that. However, Kia opted to also offer the car in its native Korea after it received an enthusiastic reception. 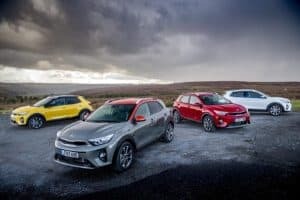 Kia expects to shift 70,000 Stonics in Europe in 2018, rising to 100,000 a year eventually, with the UK accounting for around a tenth of the model’s European sales. Equipment has been split over two trims levels: 2 and First Edition. All Stonic models come on 17-inch alloy wheels with air conditioning, all-round electric windows, roof rails, rear parking sensors, remote locking, electrically adjustable heated door mirrors, Bluetooth with music streaming, automatic headlight control, bi-function projection headlamps and cornering lights and LED daytime running lights. Grade 2 Stonics boast a seven-inch display with a DAB radio and MP3 compatibility, while and in First Edition models, this is upgraded to a seven-inch touchscreen navigation and infotainment system featuring Kia Connected Services with TomTom. Prices start from £16,295 for the 1.4-litre petrol in the 2 trim, rising to £17,795 for the 1.6-litre diesel, and topping out at £20,495 for the First Edition diesel.